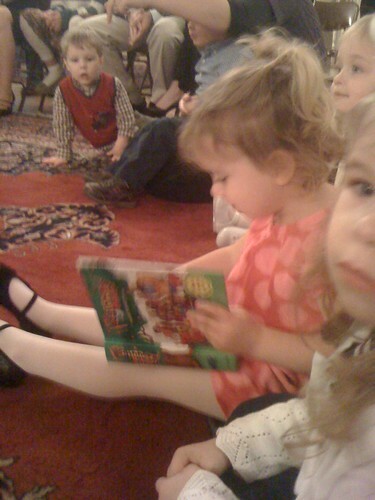 Each year the Children's Ministry Department at our church presents each child in the 2 year old Sunday school class with a bible. It is a story bible, perfect for kiddos their age. Judd and I teach that Sunday School class along with another couple. We switch on and off teaching. This past Sunday was our week to teach - and was Bible presentation Sunday. I knew that there may be a lot of kids in the class, I was right. 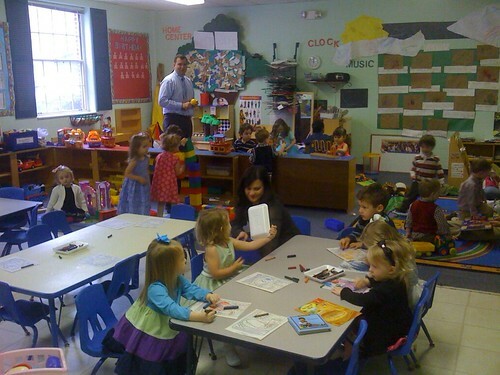 Judd and I had over 25 kids in Sunday School this past Sunday! And they were between 2 and 3 years old. I say "over 25" kids because I couldn't actually count them all - they were moving too fast. Luckily, the other couple that we teach with felt bad for us and stayed to help. We marched them all to the presentation about half way through the Sunday School hour. When Charlotte's name was called she jumped up and screamed with delight to go get her new bible. She immediately started flipping through it. We have been reading a story a night out of her new bible. Last night she told me Daddy read her the story of "Adam and Steve". I quickly corrected her - even though I do love to hear her versions of the stories!